unique in its spacious arrangement and sporty yet elegant design, packed with the top-of-the-line properties. This Azimut 62s 2018 is offered with excellent condition for sale, with new interior upholstery, fully serviced and ready for the upcoming season. For more information we are gladly available. All information is without guarantee of accuracy and completeness. Aft cabin, salon, teak on bathing platform, wet bar, extra refrigerator in the cockpit, crew cabin, Searchlight electric searchlight bow thruster, color TV, air conditioning, upholstery, bed nets on portholes, hardwood floors in the kitchen, remote control, 2-flame ceramic hob in the kitchen, full set of azimuth cutlery, radar, Raymarine radar 24 nm, Raymarine E120 display, double Racor filters for the main engines, Racor filter for the generator. 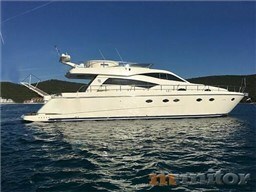 Dear Sirs, I have seen on YachtVillage your offer about Azimut Azimut 62s - 2006 (code: 462701). I am interested in the offer and would like you to contact me. Thank you.